This recipe uses applesauce, instead of apples. Preheat oven to 325 degrees. Place half the bread cubes in a greased 9- x 13-inch dish. 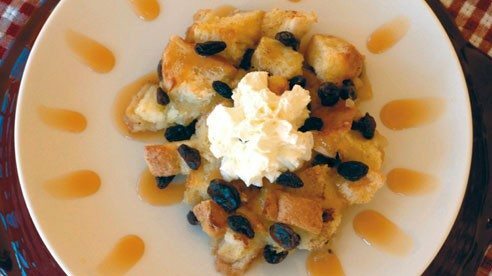 Spoon applesauce over bread, sprinkle with nutmeg and add raisins. Top with remaining bread cubes. In a bowl whisk together eggs, milk, sugar and vanilla. Pour over bread layers and sprinkle with cinnamon. Bake uncovered for 50 to 60 minutes. Serve with whipped topping.